Bacon, Coffee and Waffles OH MY! I promised ya I'd let you know when these were made available. Why go with plain old Bacon Floss when you can pick up a three pack of Breakfast Floss for only $5.99? Also had to throw this in because I love these ABC (already been chewed!) Gum Magnets. Gross and fun! Why don't I think of these things? Too Much Bacon? That's Unpossible! 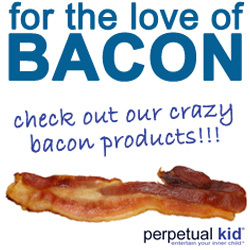 Are You Addicted To Bacon? Cooking.com is looking for Bacon Recipes!